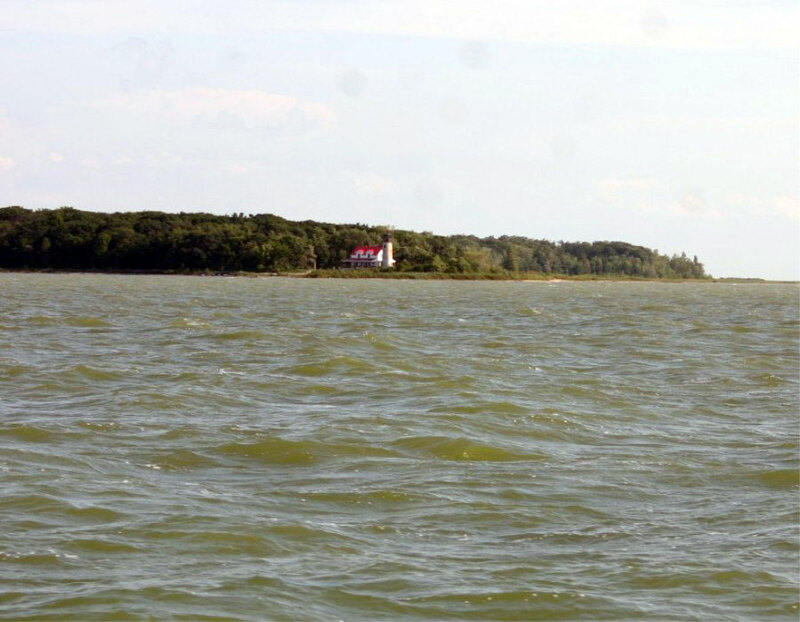 Charity Island is located 10 miles off shore and completely off the Grid. 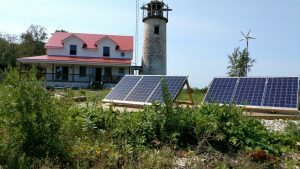 The Lightkeepers home and the Dinner Cruise operation is completely powered by renewable Energy. We combine a 1,500 watt solar panel array (six 250 watt solar panels) with a 750 watt wind turbine that work together to keep our 7,920 watt ( 7.9 KW ) 24 volt battery bank Charged. Our Battery Bank is comprised of 12 deep cycle 6 volt Golf Cart type Batteries. We wire four of these batteries into a 24 volt battery bank and we do that 3 times then wire all three banks together or ” in parallel”. This gives us almost 10,000 watts of power stored in the battery bank. As we take power out of the battery bank we rely on the Solar Array and wind Turbine to replace that power by recharging the battery bank. We use a Schneider 4024 Inverter which takes the power out of the battery bank and sends it into our service panel as AC or alternating Current, the same power (electricity) we all have coming into our homes from the grid over on the mainland. In the event we have no wind and or sun for a prolonged period and the batteries start to run to low, the Schneider inverter will automatically turn on a propane powered generator and take some of that power to power loads in the home and at the same time charge the batteries. Once the batteries are properly charged the Inverter will turn the generator off. All automatically. The system has worked flawlessly for 14 years. We have never been without power all these years. We started out with just a battery bank with a Generator and it wasn’t until five years ago we added the solar and wind components to this off grid system. As I looked into adding solar panels and a wind turbine to the existing system I learned there is really no one you can go to locally to get help on understanding how these components work, which ones were better than others, etc. Learning how to put a OFF GRID system together requires one spend a lot of time online reading and evaluating all the various claims of manufacturers make about their products. It also requires hours and hours of viewing videos at youtube. After almost six years of intermittent learning I finally purchased my first two solar panels in 2014. Those first two solar panels did such a great reducing the number of hours our generator ran I added another four panels and the wind turbine the very next year. 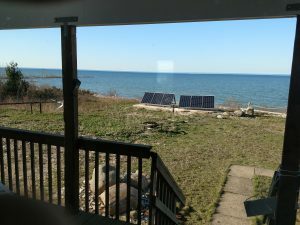 With six solar panels the battery bank rarely needs the Generator for backup charging which prompted us add a electric chest freezer and switch from a Propane Refrigerator to an electric refrigerator in 2017. 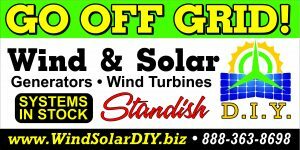 WIND & SOLAR DIY designs, assembles and prewires power systems for both off grid and grid tie applications. During the past year we have sold a dozen “OFF GRID” power systems. 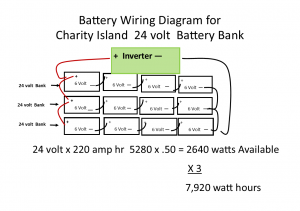 Most are close to or identical to the system on Charity Island. If you are looking to power an Off Grid home or Cabin please don’t hestitate to give us a call or stop in our store in Standish. We have roof top and ground mount displays and prewired systems in stock.